GRIND AROUND THE WEIHNACHTSBAUM! 13.12.2008! It´s gonna be a jam with 5 riders in each run, where every rider has to score for his team. 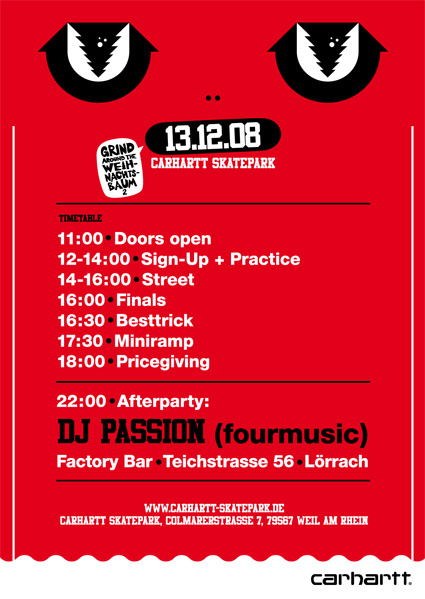 After that you can watch the Besttrick- and Miniramp-contest (in line with demand). The prize-money over all is set to 3000 Euros. Doors open at 11.00h. The contests starts at 14.00h and the entry is for free! After the skateboarding action it won´t be quiet. You are invited to the Factory Bar in Lörrach, where DJ Passion ( FourArtists), DJ Swist (The Real Deal) and DJ AndiTablez play their music. Click here for updates or write an email.